Art for the Sake of Dogs. Grant, by artist Mark Barone. Spring, 2012 issue of The New Barker. Over the last week, there have been two articles regarding the covers of national magazines. One appeared in last Sunday’s New York Times about celebrities and their babies. The article stated that the actor Matthew McConaughey received somewhere between $500,000 to $1 million to pose with his baby on the cover of OK! magazine. The magazine’s founder, Sarah Ivens Moffett had a clear idea what she wanted to see on the cover: a shirtless McConaughey, holding the baby, without the mother. McConaughey had quite another idea: Matthew, fully clothed, appeared along side Camila Alves, the baby’s mother and Levi, their two-year-old son. The other article appeared in a recent ImPrint post about the rejected covers of The New Yorker magazine. The “uninhibited outtakes” have been collected for a new book, Blown Covers: New Yorker Covers You Were Never Meant To See” from Abrams Books. Francoise Mouly, The New Yorker’s art editor since 1993 says of the cover selection process, “Sometimes something is too provocative or too sexist or too racist, but it will inspire a line of thinking that will help develop an image that is publishable.” The full ImPrint article can be read here, but be forewarned – some of the images may be offensive. Before Oprah started her magazine, research revealed that every other magazine title with Oprah’s image on the cover would sell out. That is one of the main reasons Oprah’s image always appears on the cover of O. The first issue of The New Barker, 2006. Cover artwork by Florida artist, Sonja Quillen. 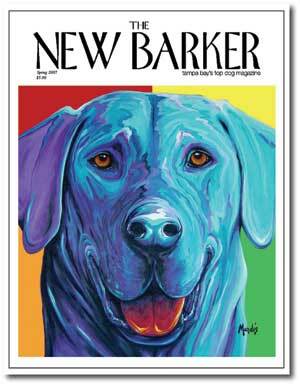 Every cover of The New Barker dog magazine has always featured an original piece of artwork by a Florida artist since its first issue printed in 2006. Selecting the artist for each cover is as much exhilarating as it is nerve-wracking, for the same reason: There is a wonderful pool of talent from which to choose. 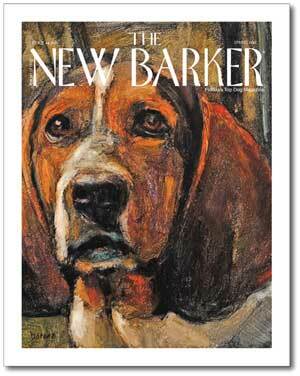 The New Barker dog magazine celebrates the art of dog® with each cover’s artwork. A simple philosophy, but not a simple process, by any means. We deviated from this Florida pool of talent for the Spring, 2012 issue because we were particularly moved by one artist’s message. And, isn’t that what art is supposed to do? It can provoke a smile, a cry, or a laugh. Art can motivate one to take action, or at the very least, to take notice. That is not to say we have not been moved by every single artist whose work has graced the cover of The New Barker. Each piece of art has meant something to us in its own special way. The second issue of The New Barker, Spring, 2007. Cover artwork by Florida artist, Michelle Mardis. Art is subjective, and we’re reminded of that by our readers with every cover. In fact, the artwork on the second issue of The New Barker elicited this response from a letter writer, “Why on earth did you put a boring black Lab on the cover of The New Barker?” Opinions. They’re like belly buttons. Every body has one. 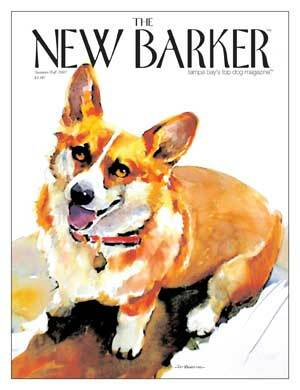 Boo, a Corgi, appeared on the Summer, 2007 issue of The New Barker. The artwork was created by Pat Weaver. 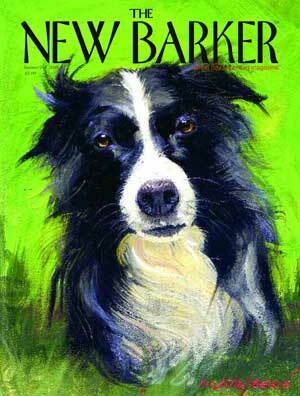 Border Collie by June Allard/Berte. Summer 2008 cover of The New Barker. The three covers that have generated the most response from readers so far, have featured a Pembroke Welsh Corgi by Pat Weaver, a Border Collie by June Allard/Berte, and a German Shepherd by Linda Chapman. Ms. Weaver is an internationally recognized watercolor artist. Ms. Allard/Berte is one of the country's foremost portraitists. Ms.Chapman's work has been widely collected and purchased by numerous museums, including the Museum of Modern Art in New York. How fortunate to have them all as Florida artists. The portrait of the Beagle on the Spring, 2012 issue is that of Grant. He was a Florida dog, who was euthanized in a Florida shelter. In our selection process, we reviewed several portraits by the artist Mark Barone, all Florida dogs who suffered the same fate as Grant. None of the portraits we reviewed in our selection process included Pit Bulls. While many Pit Bulls end up in animal shelters across Florida, we wanted to remind readers that other breeds are also available for adoption at shelters. Chihuahuas. Yorkies. Border Collies. German Shepherds. Corgis, Scotties, Poodles. And Beagles. Over the course of two years, Mark will be completing the portraits of 5500 dogs whose lives ended at a shelter. The project is called An Act of Dog. The number represents the approximate number of dogs euthanized in shelters across the United States – every single day. The author, Alice Hoffman is quoted as saying, "Once you know some things, you can't unknow them. It's a burden that can never be given away." 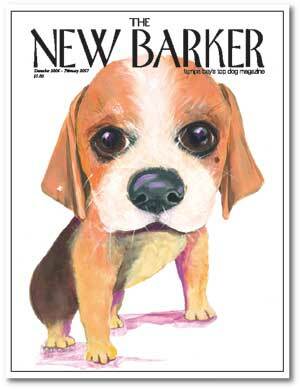 The New Barker has always been a lifestyle magazine, celebrating the beauty of all dogs, and our love for each of them. It is our editorial intent to leave the readers feeling good after reading each issue, and perhaps a little more informed. Two things I've learned for sure over the last six years: 1) publishing is not for the faint of heart; 2) trying to please everyone will please no one. View more covers of The New Barker dog magazine.